Home > Publications > Give smuggling of people no chance! Increasingly, smugglers hide people in the trailers of trucks on motorway service areas. This leads to damage or destruction of the cargo, delays, fines, confiscation of the vehicle and use of violence against truck drivers and also against the police. To ensure the safety of truck drivers and to address human smuggling in an efficient manner, we want to involve the truck drivers and transport companies as partners in order to find a solution to this problem. Their cooperation is very important. A team has elaborated some concrete and practical tips which have been spread through multilingual flyers and posters distributed on various motorway service areas and in port areas. They are displayed in clearly visible places and are available to truck drivers and transport companies. Read the posters and the flyers and apply the tips in everyday practice. You can download the flyers and posters here. 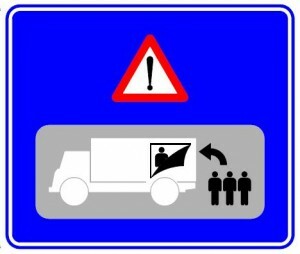 We also publish on a regular basis information on human smuggling in motorway service areas, on new trends, new methods of hiding people in trucks, new places of hiding in trucks or in cargo compartments, good practices on dissuasion and prevention of human smuggling in trucks and on motorway service areas. Talk also with colleagues about these tips and this information. The information can also be used in the training of truckers. Climbing into trucks and trailers particulary takes place at motorway parkings and in harbours. Belgian motorways likely to be used for this purpose are the E17, E19, E25, E34, E40, E42, E313, E314, E403, E404, E411 and E420 motorways. Up to now, the most frequently used parking places are those at Drongen, Groot-Bijgaarden, Jabbeke, Kalken, Mannekensvere, Minderhout, Oud-Heverlee, Rotselaar, Waasmunster and Wetteren. The problem however can always shift to other parkings. The phenomenon does not occur at motorways only; the vicinity of seaports (today mostly Zeebrugge) and industrial estates are also involved.